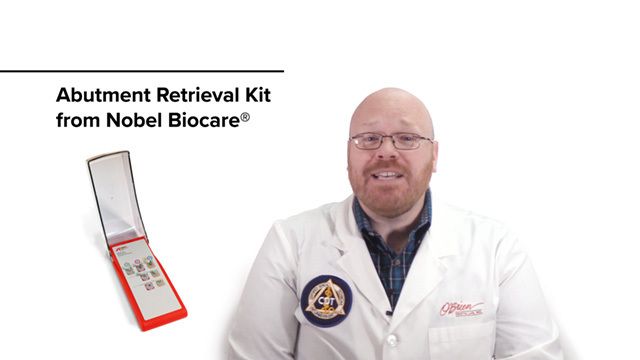 Implant specialist Alex Rugh, CDT, introduces the Nobel Abutment Retrieval Kit and shows you how the tools can remove abutments that are stuck in the implant. If you have a broken screw, you will need to use the Nobel Abutment Screw Retrieval Kit before using one of these abutment retrieval tools. The Abutment Release Pin works for all Nobel abutments, and it’s quick and easy to use so it’s typically going to be the best tool to start with for all abutment types. The Abutment Retrieval Instrument Titanium is specifically for NobelProcera CAD titanium abutments that have the internal screw threads. The Abutment Retrieval Instrument Zirconia can be used for full zirconia abutments, as well as the kind with the titanium base.